For those who are new to my blog, my sincere welcome, I hope you find it interesting. For those who are dedicated readers, my heartfelt gratitude for inspiring me to continue doing what I do. You may have seen a little “shift” in my recipes lately to a paleo style of eating. This has been due to some serious health issues that I was trying to resolve with the assistance of my gorgeous and fabulous Naturopath (if you want her name just let me know) and through changing my diet. I’m really pleased to say that we have made some significant progress and I am feeling so much better. It doesn’t mean that you have to follow the paleo way of eating to enjoy my recipes, it just means that you will enjoy the food and it will be good for you. 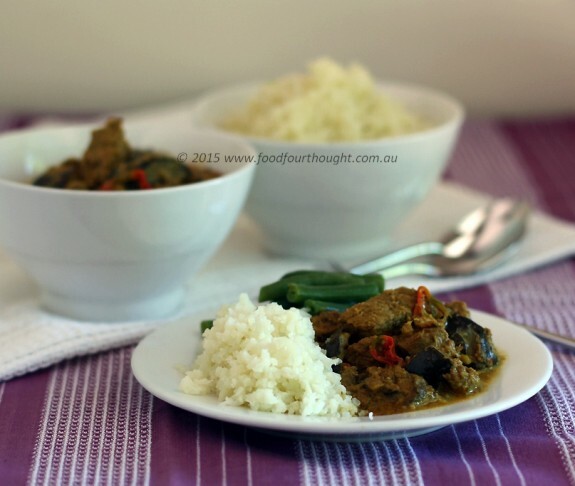 This is a recipe that I adapted to the Thermomix. It is something that has been a part of my repertoire for many years and if I ever make it for friends there are lots of positive comments. There are a few ingredients but don’t get scared, just keep reading. In the hint and tips I will make sure that I tell you how and where I buy my ingredients. Now I know it is the middle of summer (at least in Perth) so not necessarily curry season but I’ve always been a bit strange like that. I love eating hot things in hot weather and cold things in cold weather. So summer = curry and winter = ice cream. Weird, right :). No matter when you make this I hope you enjoy it. It is definitely a favourite in our house. Oh, and like many curries, the leftovers are even better :). 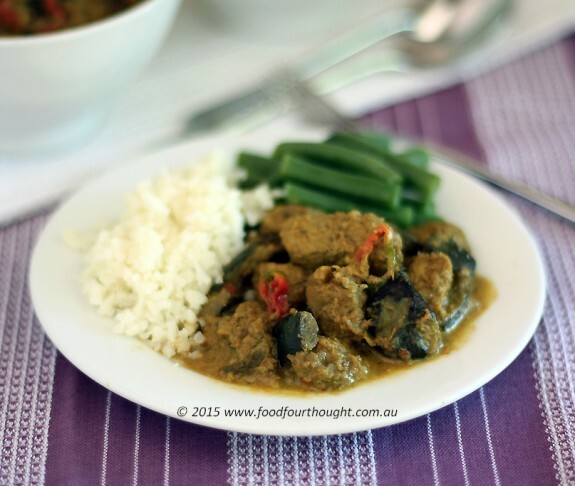 (paleo) Pork & eggplant curry (recipe by Fiona at Food 4 Thought). For paste, place all ingredients into TM mixing bowl and blend for 30 seconds on speed 7. Scrape around the sides of the bowl and repeat. Scrape around the sides of the bowl and cook for 5 minutes at 100°C on speed 2. Scrape around the sides and base of the TM mixing bowl. Store paste for another time or leave it in the bowl and use it immediately. For curry, place pre-made paste into TM mixing bowl and add pork pieces. Cook for 3 minutes at 100°C on reverse, speed soft. Add eggplant and coconut milk. Cook for 50 minutes at 90°C on reverse, speed soft. Add fish sauce and coconut sugar then cook for another 10 minutes at 90°C on reverse, speed soft. Squeeze over some juice from reserved lime and serve with cauliflower rice or side dish of your choice. My tips: *The ingredients for the paste can be purchased from Asian food stores and some supermarkets. They are all quite common and easy to find. To make it easier, sometime I will buy pre-cut lemongrass that has been frozen, just use the same weight. *You can double or even triple this paste then just divide it up. Use what you need for this recipe then keep the rest in the fridge until you want to use it. You could also freeze it. *You can substitute chicken thigh for the pork and it is equally delicious. I would cook it for the same amount of time because you need the eggplant to soften. Chicken breast would not work in this dish. ease: 7/10. Just a few steps in the preparation! taste: 9/10 I LOVE the flavours in this curry. A delicious winter (or summer 🙂 ) warmer. would I make it again: What do you think?